Oh, bless you for that! Edit: "Target The Main Haywain Generator"
i love these old shopped pictures. almost nice enough to stick on canvas and have on the wall. that's an excellent pic - nice one. ...and quite a few not-so-fanatical ones, too. Needs to be bigger. Much, much bigger. 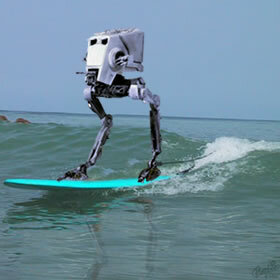 But AT-ATs can't walk on water! Can you get more than five stars for epicness? If so, there are six stars here for you! This may well be the best thing I have ever seen in my whole life. that is one *amazing* piece of work. The fighting Temeraire on Hoth. Love it. can I have than on my wall, please? ...they'd probably be the best AT-AT's in the world. Quite possibly one of the best things EVAR. So much so... Mrs Tarticus wants for Jnr Tarticus for xmas for his wall.... please Jim fix it for us and make available in a print. I feel a series coming on ?! Wowzer ! 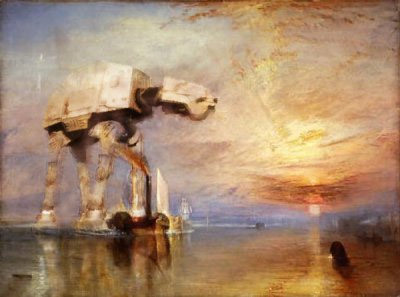 It has AT-ATs AND photoshoppery. My favourite (now) combo ! What's the largest you can do it and can I have it as wallpaper?